TO SEE where Australia is heading, look across the Pacific Ocean. Out past Hamilton Island, past Fiji, over the equator and all the way to the USA. Australia's economic future is America's economic present. Where they are now we are likely to be in a few years. What America shows us about the future should concern all of us. America is throwing the brakes on its economy by raising interest rates, even though wages growth is still below normal levels. America is well ahead of us. In Australia, interest rates are at record lows, and have been since 2016. Rates were cut to emergency levels to try to light a spark under an economy that was struggling badly. In America, interest rates hit record lows way earlier. They bottomed out in 2009 and then started rising in 2015. US interest rates are set by the US central bank, and it has a new man in charge. When US President Donald Trump was elected, he sacked the old chief, Janet Yellen, and installed his guy, Jerome Powell. Mr Powell has cranked up the pace of rate rises. There have been two this year and two more are expected. Interest rates are expected to soon be back to normal levels. Interest rates should go back to normal when the economy goes back to normal. In America, most things are back to normal. 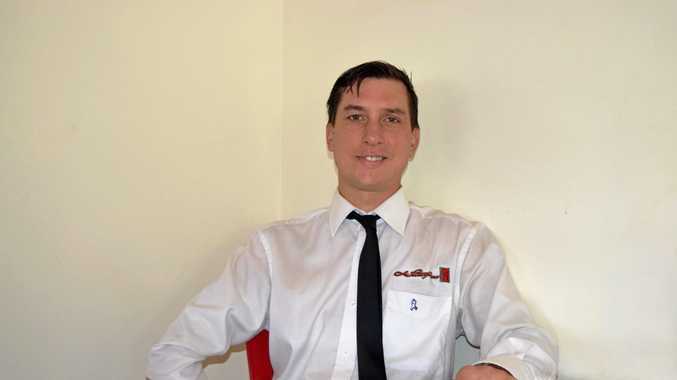 Inflation is rising, unemployment is low, growth is good. But wages? Wages still don't look right. As this next graph shows, in the past, wages growth topped 5 per cent or 4 per cent a year in the good times. But now, in America, wages growth is just over 3 per cent, and far worse for part-time workers. Powell calls the low wages growth in America "a bit of a puzzle" but he doesn't exactly demonstrate compassion, and doesn't seem to have a plan other than waiting and hoping. 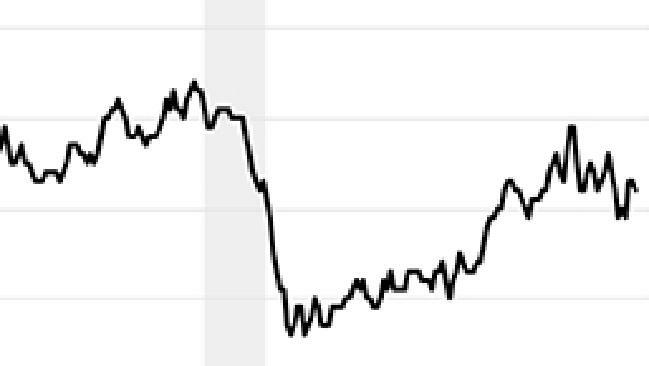 "I would say that the economy's in great shape," he said last week. In summary, America is acting as though everything is fine. But if you look at wages, things are anything but fine. This is bad news for Australians hoping to see the future. 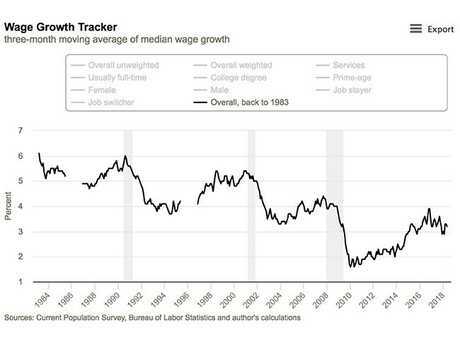 It suggests that our economy can also improve dramatically - lower unemployment, normal inflation, etc - but without real people seeing decent wage growth. Our central bank has basically the same plan as the US Federal Reserve - wait and hope for wages to get better. America lets us fast forward in this particular movie and see the ending. It shows that when it comes to wages growth, waiting and hoping is not a great plan. You can end up with rising inflation, an economy that is - on paper - booming, low unemployment, but terrible wages growth, especially for the people who need it most. And you end up putting up interest rates anyway. If inflation and wages are stuck at 2 per cent, then real wages are not improving at all. What's the explanation for the falling rate of wages growth around the world? There are many. Competition from overseas is stronger. Technology is improving rapidly, so some people are replaced. The jobs that are growing most strongly are lower-paid jobs. When there are lots of explanations, you know that means nobody is really sure what's happening. And when we don't understand what's happening, it is hard to fix. 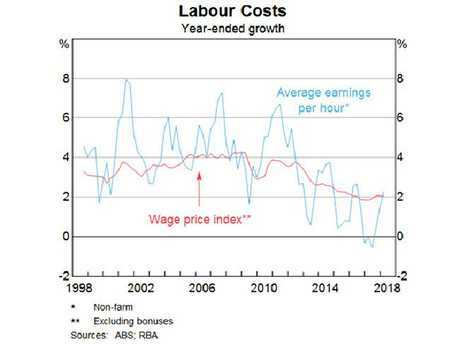 It is possible that when the Reserve Bank of Australia is finally forced to start lifting interest rates, perhaps in a few years time, our wages growth will still be stuck stubbornly low. That combination - low wages growth and higher interest rates - could be very uncomfortable for any Aussies with high debt. And as we know, there are a lot of those. What's more, this future might have been coming for a long time. 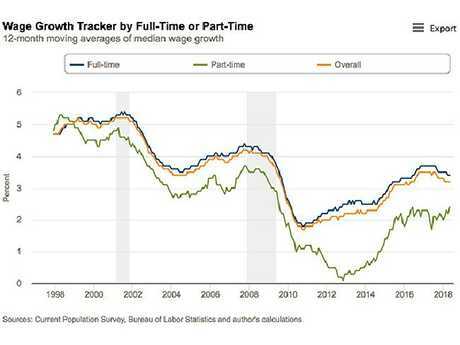 If we look at the US data over a long period, this continual erosion of the pace of wages growth starts to look a little bit like a long-run trend. Maybe the good old days were an aberration and this is the new normal? If that is the case, a future of lower wages growth might be locked in.